The Lo-Carbon T-Series Fan range utilises a low energy DC motor, developed to improve performance, lower running costs and maintain T-Series’ rugged reliability. Lo-Carbon T-Series wall models are designed to fit directly into double brick, solid and cavity walls. The two part telescopic liner accommodates wall thicknesses from 240 to 315mm. For thicker walls additional liner sections are available. Lo-Carbon T-Series wall models are provided with internal and external wall frames which fit flush with both faces of the wall. Conduit entry is provided for concealed wiring. Lo-Carbon T-Series models are supplied complete with an integral instantaneous automatic louvre shutter which will operate on both intake and extract and at any angle of mounting. 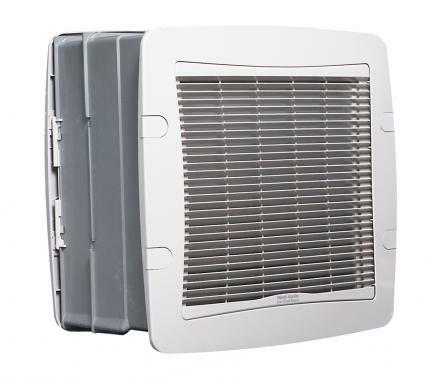 When the ventilating unit is used with a Lo-Carbon T-Series controller, the shutter can be set open with the fan motor switched Off to provide natural ventilation without the security risk of an open window. Motor purpose-designed. Suitable for running at any angle. Quiet running. Suitable for operation in ambient temperatures from -40°C to +50°C. Fitted with self resetting Standard Thermal Overload Protection (S.T.O.P.). Supply voltage 220-240V/1/50Hz. Behind the grille of the Lo-Carbon T-Series Wall model is a high performance extract/intake ventilating unit designed to fit through most wall thicknesses using the telescopic liner supplied. For walls of exceptional thickness additional liners can be used. Conduit entry is provided for concealed wiring. LoWatt T-Series Controllers are available in both Wired and Wire-less FM versions. The three speed push button surface mounted controllers provide intake/extract and shutter only options and auto mode position for use with external sensors. Wired versions are connected to the fan using a plug-in Safety Extra Low Voltage 2-core signal cable supplied (10m), allowing simple and safe installation. Alternatively, the Wire-less FM controller offers full control without the need for any wiring, ideal for premises where installations need to be carried out with minimum disruption or where surface wiring can be classed as unsightly or obtrusive. Every LoWatt T-Series Wire-less FM Controller uses unique digital signals to ensure trouble free operation. The controller will transmit through walls and floors allowing complete flexibility of design to control fans up to 30m away. Wire-less FM Controllers can dramatically reduce installation time and costs. The Immediate benefit being the elimination of unsightly wiring. Wire-less FM Controllers can be easily installed in an variety of applications including assembly rooms, banks, hospitals, laboratories, restaurants, schools, shops and public houses. An adjustable set point, solid state On/Off sensor. A pullcord provides manual override, indicated by lamp. Adjustable from 65 to 90%RH. Can be wired into controller "Auto" mode connections. Incorporates changeover switch to select low/high speed. Features & Benefits: Ambient operating temp range 0°C to +40°C. BEAB Approved. Dimensions: 87 x 87 x 33mm (H x W x D). Maximum switching load 1 amp inductive. Pullcord override indicated by lamp. Setting Range: 65% - 90%RH. Supply voltage 220-240V/1/50Hz.